On Wednesday the Colts B soccer team played their first match of the season, away in the picturesque grounds of Maidwell Hall. The team consisted of Will M (goalkeeper), Will McE, Karan M, Sidd B (captain), Spike M, Oliver H and Kian D.
This proved to be a hugely entertaining match. It had eight goals, three changes of lead, four comeback goals, three ‘wonder’ goals, three hit goal posts, one own goal, one missed penalty and great spirit and teamwork from both sides. In the first half the score went 1-0, thanks to a Maidwell own goal, 1-1, 1-2 then 2-2, thanks to a Spike free kick that David Beckham would have been proud to have scored (the first of his two ‘wonder’ goals). Right near the end of the half Maidwell scored again to lead 2-3. Throughout the second half Stoneygate showed a little more skill in possession than their opponents. Sidd, Oliver, Kian, Karan, Spike and Will McE all looked calm on the ball and we developed our play patiently. Maidwell were more physical in their approach, but it was effective and they deserved their lead. Will McE was outstanding in defence and I had decided to give him the ‘Man of the Match’ award after just ten minutes of play. 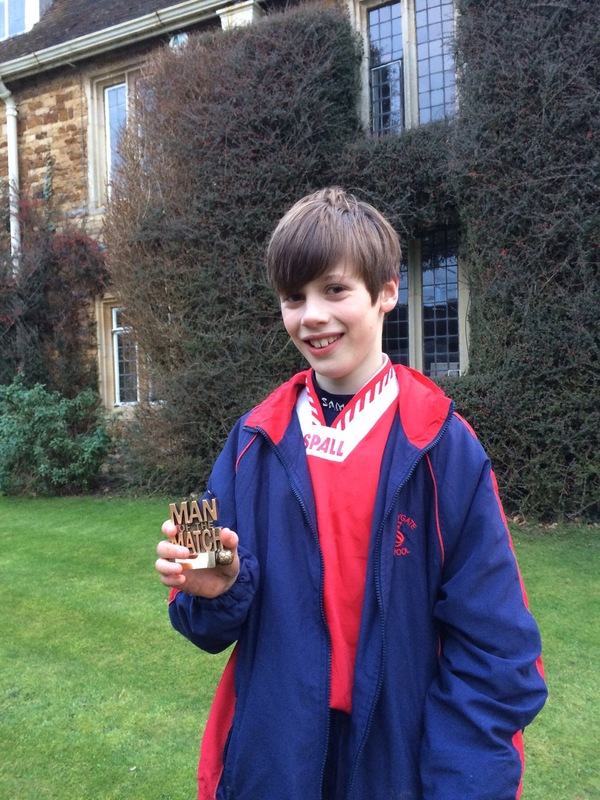 Will M looked composed in goal and could do little with each of Maidwell’s goals. Hence, all of the boys contributed to a proper team performance. Trailing 2-3 it looked like we may miss out, but the best was yet to come. Firstly, Spike crossed in a super ball from a free kick, Kian headed it goalwards, for what would have been an early contender for ‘goal of the season’, only for it to crash against the post and to bounce away. Minutes later Kian did hit the target, taking us to 3-3, after some fine build up play. Then Spike picked up the ball inside his own half and set off on a dribbling run. He beat one, two, three, four players and then smashed the ball past the goalkeeper – a goal that is unlikely to be bettered all season and an event that the ‘Champagne Moment’ award was invented for. Thus the score moved to 4-3 and the lead returned to Stoneygate. The game looked won, until almost the final play of the match when Maidwell scored their own ‘wonder’ goal. It was a superb volley from well outside the area. As the final whistle sounded the score was left at 4-4. In the final reckoning it was a fair result, as neither team deserved to lose and ‘football was the true winner’! On Wednesday the entire Colts squad travelled away to Wellingborough and they ended up playing their 7-a-side matches in some fairly extreme conditions. It was great credit to our boys that, despite the rain, the mud, the strong wind, the cold and the hail, we did not hear any moaning. They just got on with it and tried to win their matches. The A VII (featured in the photographs above) produced the performance of the day. They took the lead at the height of the storm, with a goal scored by Dom. Then there were chances to both teams and some stout defending was required by Dom, Arjun, Henry and Archie Gi. In the second half Wellingborough hit the post twice, equalised and then missed a series of chances to take the lead. However, the drama of the day was not over. Having weathered this second ‘storm’ we broke upfield and Fin scored in spectacular fashion to record a 2-1 win. It was a victory for determination and tenacity as the work ethic of the whole team, in trying conditions, was superb and Wellingborough were the better side for large parts of the match. The B VII produced a fine performance to record a 1-1 draw. Mr J reported that they outplayed their opponents in all aspects of the game, apart from on the scoreboard. Despite the mud, they still put together some fine passing play, led by Matthew, Alfie and Ed. Hugo and Oliver were the key members of our defence. Matthew scored our only goal of the game. Our C VII, D VII and E VII encountered strong opposition, as Wellingborough’s larger year groups took effect. 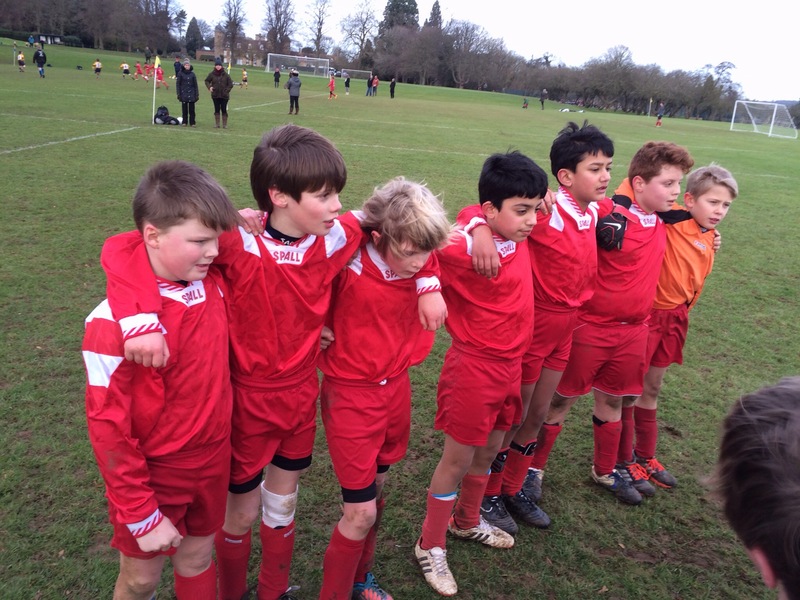 The boys worked hard and showed some fine footballing skill, but we suffered three defeats. Our defences struggled to clear the ball in the poor conditions. The C VII lost 1-6, with a goal from Will H. Harry took the ‘Man of the Match’ award and Kian, Tom and Will H all played particularly well. The D VII lost 0-6, with key performances coming from Karan (‘M of M’), Sidd, Alex and Monty. The E VII lost 0-9, with Josh taking the ‘Man of the Match’ award and Jake and George making strong contributions. On Monday Stoneygate hosted a Colts Soccer 5-a-side tournament, on the Astro pitches at Glen. We formed seven teams and Twycross brought along four teams to face us. The event proved to be a ‘feast of football’, with every single Colt representing the school (as will happen again on Wednesday against Warwick). Our boys should be commended on their super spirit and the high level of skill that they showed. It was very satisfying to watch every one of our teams, from the A to the G, trying to pass the ball and using their skill, rather than their power, to try to beat their opponents. This means that over the course of over one hour of football, on two pitches, we conceded just one goal, despite fielding seven teams and Twycross playing some equally good football on occasions. This achievement will take some beating over the course of the term. Well done to every one of the boys that took part. 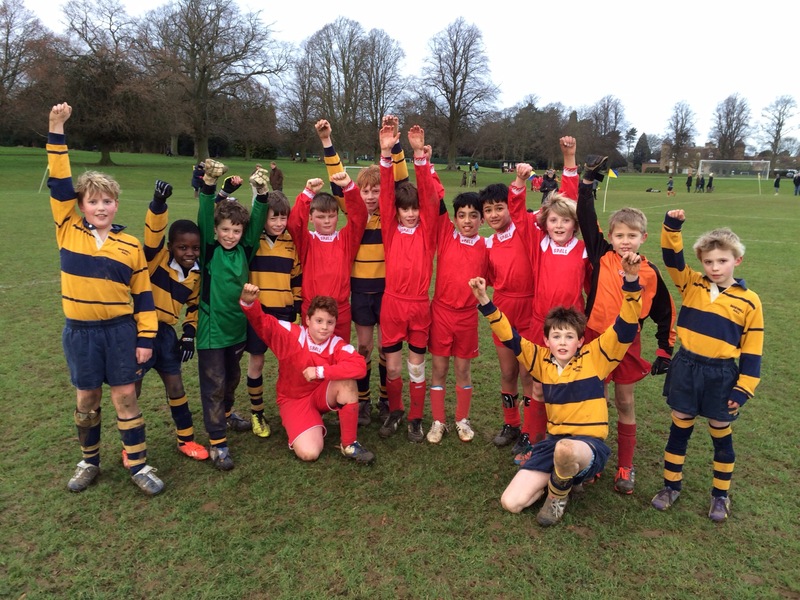 On Wednesday the Colts A team travelled away to play Brooke Priory in an 8-a-side match on grass. The team consisted of Fin, Archie Go, Archie Gi, Dom, Patrick, Arjun, Henry and Kian. The Colts A rugby team had a very close match last term, so a tight game was anticipated. The match did not disappoint, as it was a very entertaining and exciting encounter. Both teams looked comfortable on the ball and played a positive, passing game. There was no aimless ‘kick and rush’. Archie Gi, Dom, Henry and Arjun formed a solid defensive unit and they covered each other very well. In midfield, Fin was a constant threat, but he was marshalled very well by the opposition. Patrick offered great support and Kian proved to be a great addition to the team. Archie Go had limited chances in attack, but he held the ball up well and worked hard. We took the lead from a rather scrappy own goal and then, late in the half, extended our lead when Fin scored a superb solo effort. He broke from our goal area, beat two opposition players and then ran, at pace, to the other end, to smash the ball past their goalkeeper. The second half was equally entertaining with some fine attacking and stout defending from both sides. Brooke Priory scored to make the last ten minutes very tense, but we held on to win 2-1. Player of the Day went to Henry for his solid defensive work. Champagne Moment was shared between Fin, for his goal, and Kian, for his clever ball skills in one of our attacks. On Wednesday a combined squad consisting of both Colts C and D teams competed in a fixture against Maidwell Colts C.
This combined team, dominated possession and were able to capitalise on the opportunities that arose during the game. The strength of both the Colts C and D teams was evident throughout the game. Various player combinations were used during the course of the match, all of which experienced success. Highlights of the match included; Olly penalty save, a weaving run and superb finish from Tom B and hat-trick from Kian. Goal scorers; Kian (3), Tom (2), B. Leverett. On Wednesday the Colts A VII squad travelled to Lutterworth Soccer Centre to take on a traditionally strong and physical Maidwell team. As our Glen pitches are waterlogged we chose to play on the rubber crumb Astro pitches at Lutterworth to encourage skilful play. We used a smaller, less bouncy ‘Futsal’ ball, with the same aim. The A squad consisted of Fin, the newly appointed captain, Archie Gi, Patrick, Dom, Arjun (GK) and Henry B. Sadly, Archie Go missed the game due to illness. From the opening minutes onwards it was clear that our boys had much more composure on the ball. We passed the ball with great confidence and it was a delight to watch. We raced to a 5-0 lead through goals from Fin (2), Archie (2) and Patrick. Fin was a constant threat, showing superb dribbling skills, Patrick and Archie controlled and passed beautifully, Dom and Henry were solid and dependable at the back and Arjun was very reliable and showed developing confidence, in goal. From this point onwards we altered the balance of the teams to make it a more even contest. The first match ended 7-2 (with two more goals to Fin). The second match was closer from the start and went to 3-2, then 5-4 then 7-5, before we won 8-5. The most pleasing aspect of this match was that we continued to try to play a confident passing game, even when Fin was off the pitch and when we allowed Maidwell to have extra players on the pitch. Second match scorers were : Fin 5, Patrick 2 and Archie. This was a very pleasing start to the season, but we face a tough challenge next week versus Brooke Priory. Please note that this fixture is now AWAY.